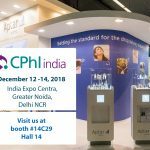 Aptar Pharma is pleased to be exhibiting at CPhI India once again. Taking place at the Bombay Exhibition Centre (BEC), Mumbai, from November 28-30, the major exhibition will see the movers and shakers of the pharmaceutical industry come together to celebrate current trends and innovations. This year, Aptar Pharma’s booth will be based at stand No. H77, Hall 1. Our team of experts will be showcasing Aptar’s wide product portfolio, including Connected Device Systems for better patient adherence and compliance. A dedicated innovation area will feature the megatrends that are currently influencing the drug delivery industry. CPhI India is predicted to attract more than 50,000 visitors. It will be an excellent opportunity to network with fellow pharmaceutical experts and learn about the latest developments in India’s pharmaceutical industry. Leading Aptar’s contribution to the discussion is Sai Shankar, Director Business Development – Connected Devices, who will present an informative pharma talk on the growing trend of connected healthcare solutions. The seminar will reveal the findings of a recent study on Aptar’s integrated connected pMDI, and demonstrate our connected health devices portfolio which supports respiratory treatment for patients. Sai Shankar’s Exhibitor Showcase will take place on Tuesday, November 28 from 13:00 – 13:45 at Hall 7A, Goregaon. From November 28-30, we invite you to join Aptar Pharma at booth No. 77, Hall 1. Our team of experts will gladly offer an overview of their wide product portfolio, including innovative drug delivery systems, components and services covering a broad range of delivery routes. Previous PostVIDEO: Aptar Pharma – Improving Lives, Helping Customers SucceedNext PostVIDEO: Dispensing Sour Cream ‘The Aptar Way’!